A while back I was asked by a friend, Ian Taylor, if I would be interested in going on a trip he had organised. I was to go in the capacity of medic and guide. He knows my background well as I had worked for his company previously and he vets all who work for him very strictly. Ian’s approach to the welfare of his clients is paramount. 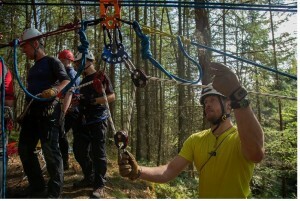 My background is as an active mountain rescue medic trained on rope rescue and all aspects of mountaineering rescue. 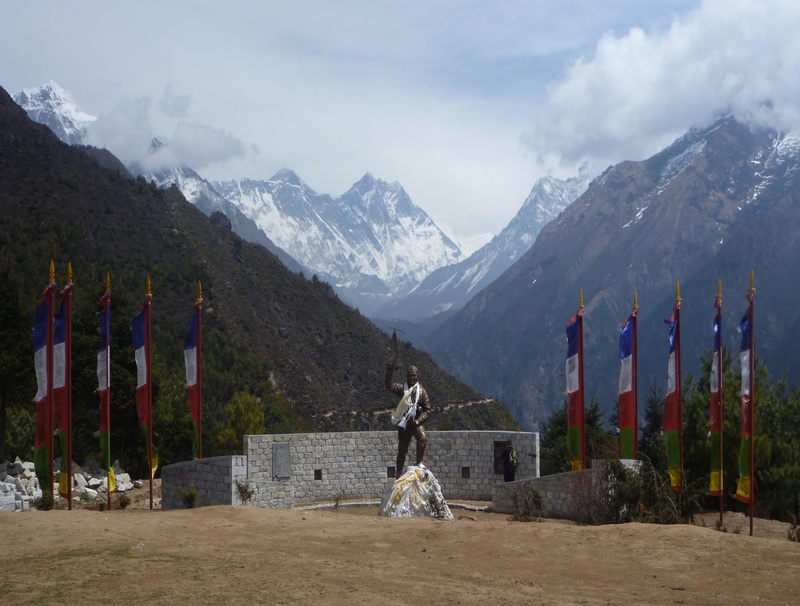 The plan for the trip was to guide a group of 22 clients to Everest base camp. The group then planned to split with a smaller group of 7 making our way up the Imja Valley to a peak called Imja Tse, more commonly known as Island Peak. We would all then meet up again back at Kathmandu. We would then have a few days of down time to see the amazing sights around the city. 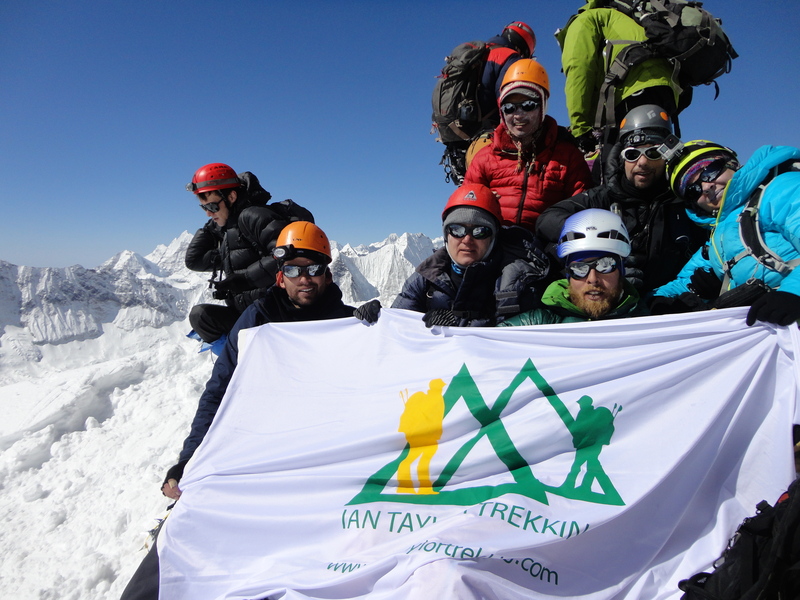 It would take 22 days in all from Kathmandu to achieving our goal and returning. We met all our clients and soon to be very good friends in Kathmandu in a lovely hotel called the International Guest House. We made all our introductions and went over a brief itinerary and route on a map just to give people an outline of what was ahead of us. As soon as that was over we went straight into business mode. We went through each team member’s kit. What to bring, what not to bring. If we can bring luxuries or practical things instead, chocolate or spare underwear is a hard decision when it comes down to it. Ian then introduced me to the Sherpa’s that we would be working with for the entire trip. They were so nice in welcoming me to their country and hoping that we have a safe and happy trip. Little did I know how much I would have to rely on these few men for so much of the trip. I would consider myself competent in the hills with my abilities but these true gentlemen are on a whole different playing field. Dawa, Little Dawa, Ang Kami, Sonam, Tendi and Purba, all of these men opened my eyes to what generous and caring people are. We were to leave for the airport at 5 am so we all packed our kit and retired for the night to be ready for our long journey in the morning. We got our kit together for the yak herders to take and set off up the trail to our first stop called Monju. It was a handy day, a sort of introduction day. Ian and me spread out through the group watching people’s water intake, speed of walking, any signs of needing a helping hand or just reading the group as to better take care of them. It was a short day but it was also a wet day. We were all saturated as we arrived into Monjo. We arrived in to lovely cups of ginger lemon tea and milky coffee. It was our first night on the trail and in the lodges so of course the packs of cards got broken out and we all get stuck in to a few games. Everyone brought their own twist to the game. We agreed the game of the trip would be S*#THEAD, which I was called many a time after losing. We would all head to our cots around 8 or 9 to be up and ready by 7am for breakfast and out on the trail for 8. We always attempted to get up early, arrive to the next spot early and enjoy the rest of the day. It also means that if any problems arise we have plenty of light to deal with them. The next day was going to be a long day. We were heading from Monju up the valley climbing all the time to Namche Bazaar where we were going to be taking 3 days for acclimatization. 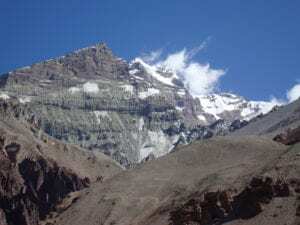 We would be going on different training hikes gaining altitude each day and coming back down in the evening. We entered Sagarmatha Park that day too. It was a great day; sun splitting the sky and the entire group were gelling nicely. We could see the friendships sparking already. I stayed at the rear as back marker to help or motivate anyone that was finding the going difficult. We always had fun at the back chatting and laughing the whole day along the trail. We stopped at a suspended bridge along the way to take a break. We were all taking photos and re-hydrating. Suddenly, one of the group stepped out of an oncoming porter’s way but inadvertently stepped off the start of the bridge area and down the side of it. I thought when I saw her fall off the bridge that it was lights out. She fell about 10 feet down into a ditch area rather than the 500ft fall just metres away. She had a severe break to her right ankle. As a mountain rescue medic I dealt with the injury and got her assessed and splinted. While I was doing that, Ian was organising an evacuation plan and helicopter evacuation. We also had a doctor and a nurse on the hike with us so the casualty was in very good hands. We got her back up onto the bridge and then without any hesitation the Sherpa’s decided that they would take turns and carry her down to a suitable heli landing zone further down the gorge. As they carried her I went along side protecting her ankle along the way from anymore damage. We got the heli in and the casualty out without any trouble and got back on the trail. It was an experience that made the group realise just how things can go from good to bad in a split second. I am happy to say that despite suffering a severe leg injury our group member received excellent care and after being treated in Kathmandu flew home to recover and recuperate. Tenzing Norway memorial above Namche Bazaar on the Everest base camp trek. The next two days were spent chilling out in the afternoons after small morning hikes. We all got to acclimatise well and were really fighting fit when we set off for our next stop in Tengboche further up the valley. The days were glorious with sunny mornings and with views that stopped you in your tracks every time you looked up. To our right the whole way up the valley standing at an impressive 6,814 mts was Ama Dablam. The mountain seemed to glare down upon us all day screaming “climb me”. Maybe it was just me but I may have fallen for her allure. She certainly could draw you in. I may have a couple of photos of her! 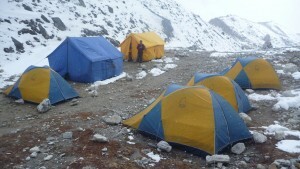 We stayed in Dingboche for two nights and we had an acclimatisation day with a gain of 400-450mts and then back down. That evening as usual we all sat around playing cards and chatting about the coming few days. 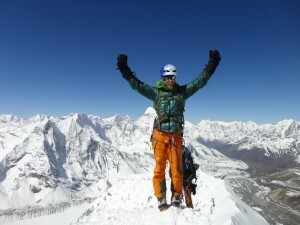 Another Mountaineering team happened to be staying in the same lodge and we got talking to Alan Arnette that night about his group which was heading for Lhotse, Everest and possibly with a double Everest /Lhotse climb. 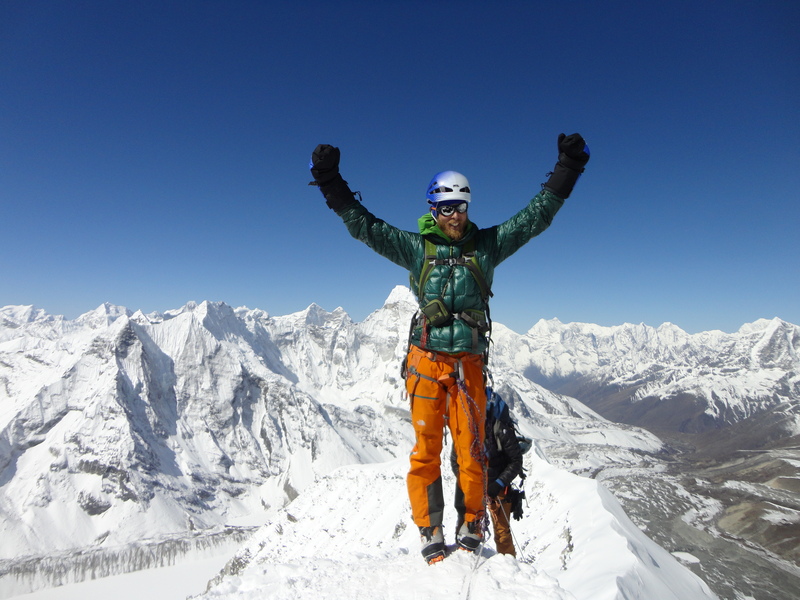 The next day we all headed for Lobuche 4,900m. As we got into camp, the weather changed with massive clouds rolling in along with a heavy dumping of snow. The snowfall continued all night. When we awoke there was a solid dump of around a foot of snow. It was unfortunate but after a lot of debating and discussion, Ian had to make the decision based on what was safest for the group. 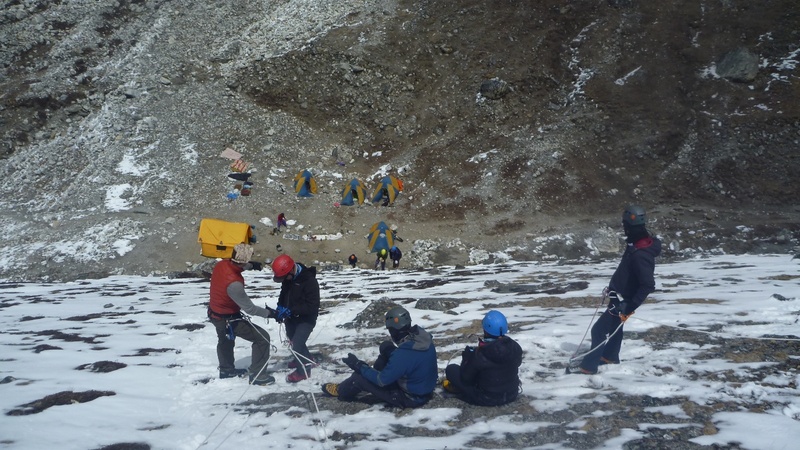 That decision was to descend back down to Pheriche 4,200m and cancel going forward to Everest base camp. It snowed for a further 3 days after this. It was a tough decision but the safest and correct decision for the group. We had a full day of training the next day, firstly ascending the ropes using a jumar then traversing along the top using the same method and on to a descending line using a figure of 8 and safety line. We pushed everyone hard that day even when it started snowing and the weather got very cold we kept pushing people saying that if you can do it in this weather you can do it in any weather. The next morning we packed our tents up and headed for high camp. We wanted to get there just after lunchtime, get to bed, have some sleep and set off for the summit at 12.30 or 1.30 at the latest. It all went pretty much to plan and we were all on route for crampon point in good time and in high spirits. We got geared up at crampon point. 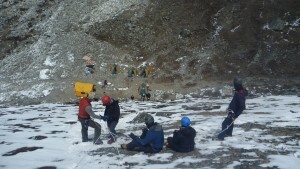 We all got harness, crampons and roped together to cross the crevasse field ahead. Ian asked me to go first and keep an easy pace and he stayed at the rear to keep a good eye on the team. We came through the crevasse field in good time and headed for the headwall which is around 250mts of 45 to 60 degree ice. Our lead Sherpa had made easy work of it and had gone ahead to fix our own new lines so we wouldn’t have to work with insufficient ropes that may have been damaged. The head wall really put us through our paces and really made us earn the summit which all of us got to sit on top of fortunately. We then headed back to Chukkung for a well-deserved sleep after starting at 1.30 am. We finally reached Chhukung at 7 pm the next evening. It was a seriously long day! The next morning I woke at 6 am to a very bad situation. In the midst of all the excitement I had overlooked my very cold feet and the next morning they were still icy cold. On closer inspection I discovered I had mild frost bite to both big toes and blistering on the toes on either side. Ang Kami, Ian and me discussed it and decided that the best course of action was to heli out and get medical care for my feet rather than walk out with the risk of more damage. I got a heli ride to the Ciwec Clinic in Kathmandu where I received excellent treatment. I got released from hospital the same day and went to the hotel to chill out and take care of my feet for 3 days while the others made their way out. It was unfortunate but hey I got a lift out and was at the bar before the rest of the group. I was a little frostbitten but what’s an expedition without a little frostbite! The next day, Saturday 25th April, a few of us were going to do a bit more sightseeing and shopping in the local markets. Viktor and Paul were going to go shopping and then meet up with us in Durbar square. Magda and me were going to go for a decent coffee and then visit the Sherpa shop before following the lads up to Durbar square. All was going to plan till we came across this little local market and had decided to go for a closer look. Just before we entered we were laughing at how dangerous the roof looked from the outside. The market was of bamboo structure with plastic sheeting over the top and tires in the sheeting to stop it blowing away. 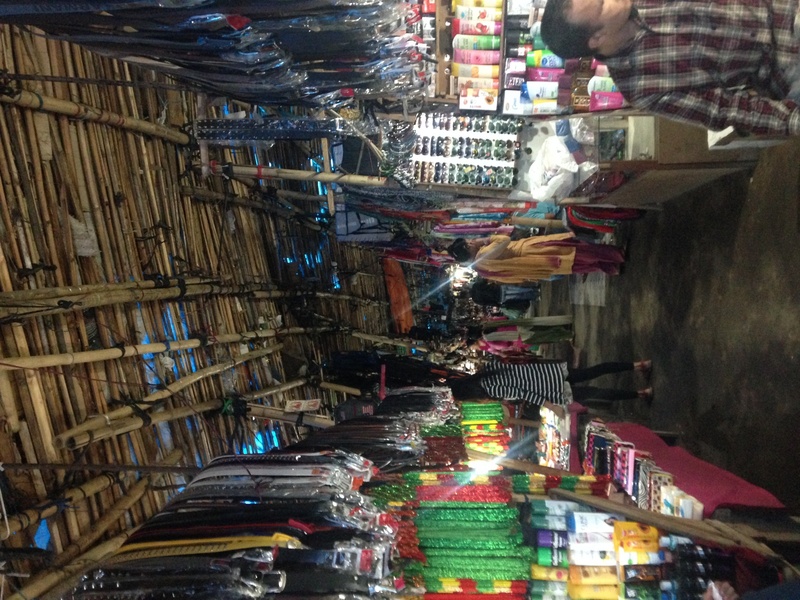 We were only inside the market for a few minutes when the earthquake hit. The market went completely black a few moments before the shaking started. As soon as it started we knew this wasn’t normal and that we needed to get out of there. We had passed an exit on our left about 20 mtrs back and I grabbed Magda and we both made a dash for it. There was a lot of screaming and crying, it was surreal. When we got outside we followed a few locals that were congregating just outside in an open area but we were still surrounded by electricity poles and masts. I didn’t feel safe so we kept on moving and found a large square without any buildings and no overhead lines. I was shaking like a leaf and the ground was still vibrating under us. A local man came over to us and calmly asked if this was our first earthquake. He told us to sit down and wait as there would be aftershocks. We sat for a while in complete shock finding it hard to comprehend what forces could move us like that. It was extremely frightening. After about 20 mins we decided that we should continue on up to Dunbar square as it should only be around five mins from where we were. We wanted to regroup and make our way back to the hotel. On route we had to take a minute to stop and sort our heads out, the adrenaline was still firing around my body in fight or flight mode and I couldn’t stop shaking or even think straight. Having Magda there helped to keep me focused. I had someone that I felt responsible for and that I needed to keep safe. We continued up an avenue just down the road from Durbar square when a second shock hit us. We ran down the road to an island in the middle of the road where a lot of Nepalese had gathered away from the buildings. We got talking to two guys on the roundabout/Island and they had told us that Durbar square was completely destroyed and there would be no point in continuing up to it. We decided we would head back towards the city and assess the situation as we went along. It was complete chaos, roads had split apart, buildings had been completely flattened, there were people crying and screaming all around us. One siren turned into two sirens until it just sounded like one continuous siren. As we were walking down we were passing a large park and it seemed like hundreds if not thousands were congregating in it. We continued on passing by fallen buildings and collapsed arches until the roads seemed un-passable. Walking by the back of some shop or store room we noticed locals were buying water. We picked up some water not knowing how long we may be displaced. We had already been 4-5hrs without water or food. Both of us decided that we should go and sit in the park and try to contact our families to let them know we were alright and then try and contact the rest of the team. Luckily I got one call out to my family as did Magda. It was becoming apparent that this was a lot more serious than we first thought. We managed to get in contact with Ian and he had the rest of the team all together and safe. He was delighted to hear we were safe and well too, you could hear the relief in his voice! It was getting close to 4pm and we didn’t have any kit or gear to take care of ourselves if we got stuck out in the dark. We started making our way back to the rest of the group. Buildings were down all over the place. Every street we went down there was devastation and 100’s of people were wandering around in shock at what was happening around them. We kept feeling tremors, they were only minor but they still made us shake. When we got back to the hotel it was hugs all round, we were so lucky that the entire group were safe and uninjured. We had our camp set up and it felt good to be out of the hotel. For the next three nights we stayed in the tents. We ventured out in search of any place serving food or hot meals and then returned to the hotel courtyard. We worried every time there was an aftershock. As we walked around the streets we started to see the amount of damage that had been caused. It’s quite incomprehensible how or where they will start to rebuild. If houses weren’t damaged the ones next to it were so they were still unsafe to go back inside. There were complete neighborhoods absolutely decimated by the whole event. Outside the city was going to be even worse off. The houses weren’t as well built and the resources just weren’t on the ground to help. In the entire 4 days after the event we didn’t see one ounce of government help or aid to any of the locals and we were in their capital city. I could only imagine the damage and lack of resources outside the capital. The only help that was going on was from local to local! In the aftermath of the earthquake a shop that opened for a few hours a day still sold water for 25 Nepal rupees. They never raised their prices. There was no exploitation, no greed. It just shows the character of the people. I am convinced even when they have nothing they would still give you the shirt of their back. I truly feel guilty about getting out safely. I know that I shouldn’t but I do. I feel for the guys that I made friends with and I worry about their families. They are truly the salt of the earth I cannot speak any more highly about them. I would give them the shirt of my back anytime! This tragedy will go to the back of people’s minds once the news stations decide to pick something new to report. What we do now will define who and what we are. It is human nature to help others, well I think it is and if there is anyone reading this that can or will help please do not hesitate to get in contact with me. This was a Himalayan adventure that would certainly shake things up. 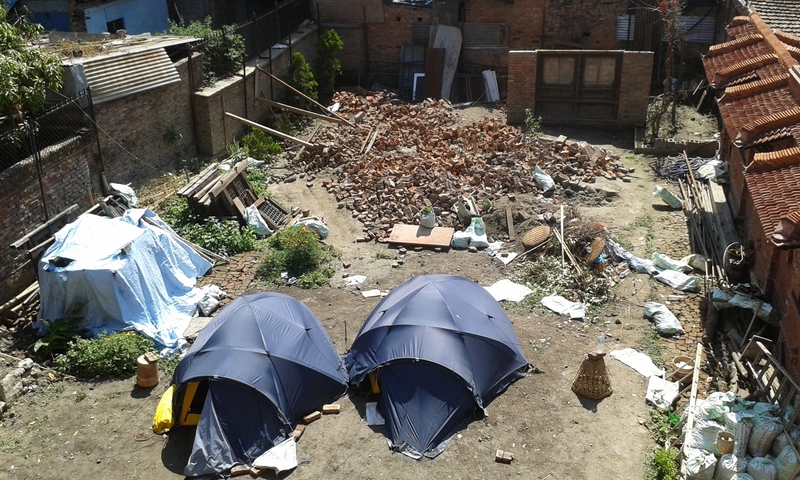 PLEASE DONATE TO THE GOLI VILLAGE APPEAL.